This is a very neat Handmade Saltire Pendant with a Lozenge shaped glass bead and faceted blue crystal rondelles. 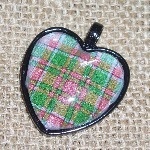 Pendant part measures approximately 1". Choice of chain types and lengths avaialble.